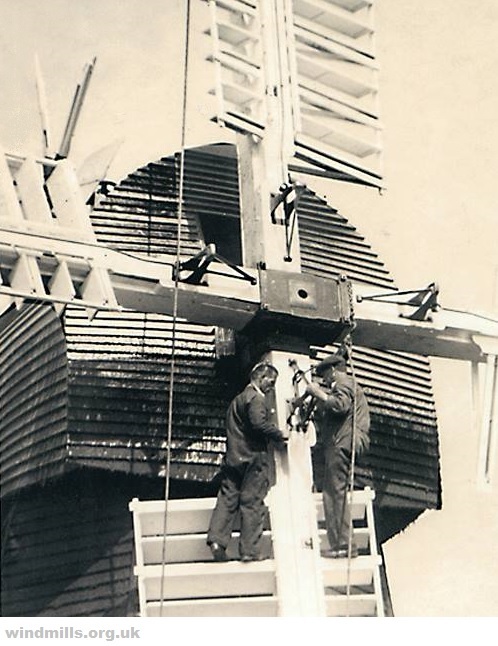 An interesting photograph, sent in by Gary Morse of Folkestone, showing some maintenance being done to the sails of the windmill in Stelling Minnis, near Canterbury, Kent. The windmill was built in in 1866 and unusually was in commercial use until the late 1960s. It is now owned by Kent County Council and open to the public every Sunday afternoon between Easter and the end of September each year. This entry was posted in Old Images, Windmills and tagged Kent, windmill on July 4, 2014 by Tower Mill.